Searching for quotes and sayings about Advice. Now no need to search for them, here I have compiled some of the quotes and sayings about Advice. Just hope you like some of these quotes and learn something new from here. 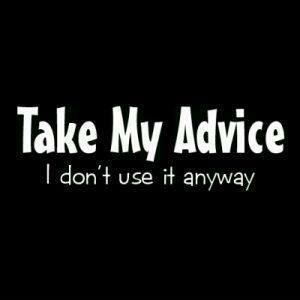 Don't give your advice before you are called upon. How true Daddy's words were when he said: all children must look after their own upbringing. Parents can only give good advice or put them on the right paths, but the final forming of a person's character lies in their own hands. It is very good advice to believe only what an artist does, rather than what he says about his work. We've no use for intellectuals in this outfit. What we need is chimpanzees. Let me give you a word of advice: never say a word to us about being intelligent. We will think for you, my friend. Don't forget it.